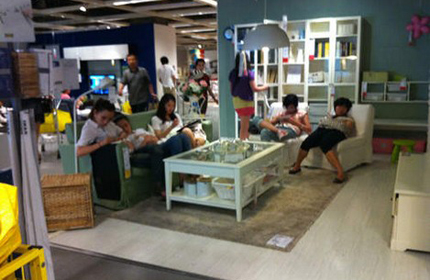 It must be the meatballs or the risk of getting caught, but young people keep overstaying their visits to Ikea stores. And it's not to get in some extra shopping, but for bonafide sleepovers. It looks like the prank took off after this Belgian duo filmed their experience in August hiding in a closet at the Swedish furniture store until it closed. 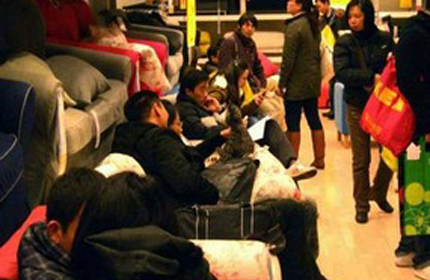 Since then, others around the world have tried to imitate their successful sleepover. Videos of sleepover attempts in the UK and elsewhere have popped up online. The prank took off after this Belgian duo filmed their experience in August hiding in a closet at the Swedish furniture store until it closed. 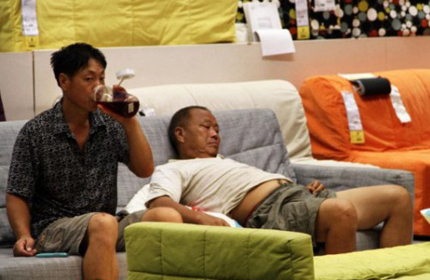 The pair entered the store when it was still open, helping themselves to plates of Ikea's famous meatballs. 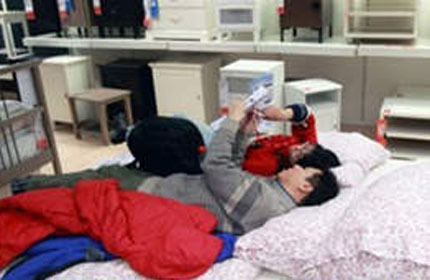 The pair then hid in one of the furniture store's closets until the shop closed for the day. They had to hide in the cupboard for three hours. At midnight, they rolled out and began their rampage. 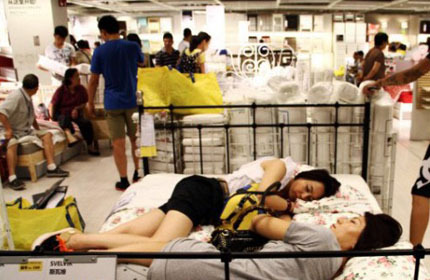 The teens tried out Ikea's beds, commenting that they were "pure heaven". They even rated the bounce-ability from 'one to five meatballs'. 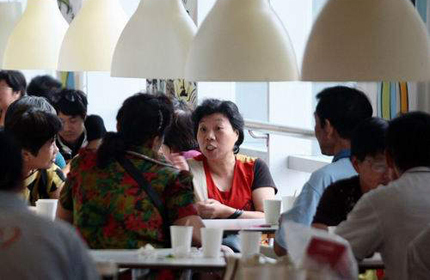 They slipped back into the cupboards at 5.45am, before escaping the store when it opened. The BBC reported Wednesday that Ikea is not pleased with this YouTube-worthy prank that has spread beyond Belgium to Australia, America and Japan. The store isn't charging the Belgian vloggers, but store officials are strongly reminding customers that sleepovers aren't allowed. In an explicit rip-off of the Belgian video, two boys in Poland try to recreate the original "Two idiots" video. Mashable has a call out to Ikea, but has yet to hear back about the sleepovers. A Swedish newspaper reported in October that two teen girls were arrested for trespassing after they were discovered the next day after their Ikea sleepover. 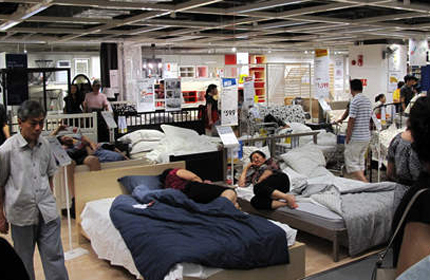 Since Ikea is cracking down on the overnight stays, it might be worth it to bring back Airbnb stays at the store. Like the duo said in the original sleepover video, the beds are like heaven - even if they've been touched by shoppers all day. 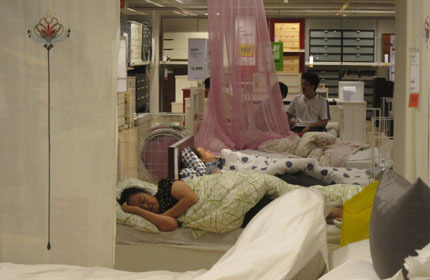 Ikea stores in China and Hong Kong change bedsheets daily for customers who nap on their display furniture. 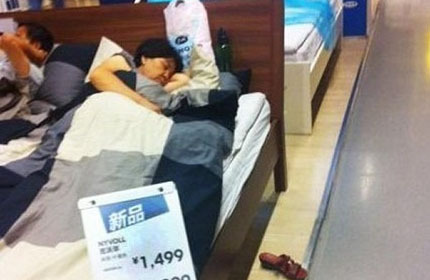 These Ikea visitors often make themselves at home and take naps in the beds on display. 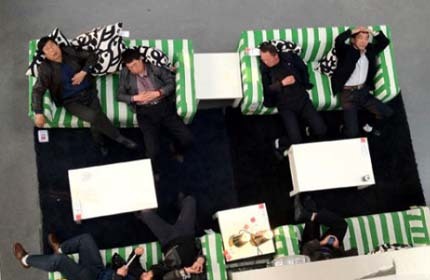 Visitors also spend a lot of time relaxing and chatting in the Shanghai outlets. 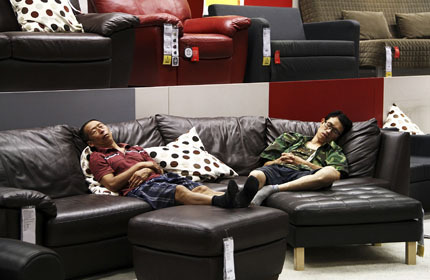 Display sofa sets are also popular places for a short nap. 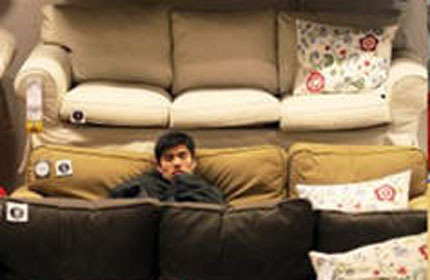 Some couples get very cozy on the sofa sets. 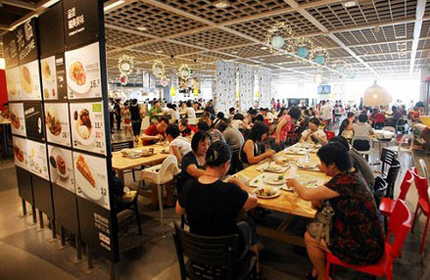 Chinese Ikea stores were also swamped during days when their cafes served free coffee. 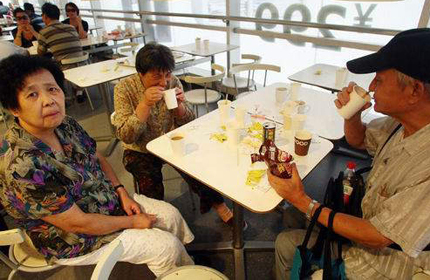 These free coffee drinkers love the IKEA canteen because the city has few affordable places for middle-aged people to date and make friends, said China Daily. 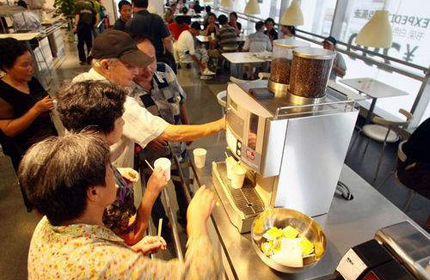 Wall Street Journal reported that those between the ages of 45 and 65 visit Ikea cafes to find new love while drinking their free cups of coffee. 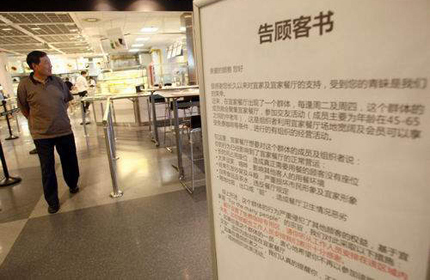 IKEA posted a notice in the restaurant saying that the free coffee drinking group has caused trouble for the operation of the restaurant. 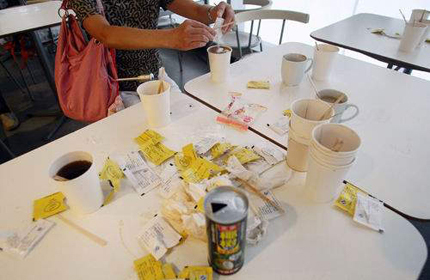 According to the notice, the group occupies seats for a long time, preventing other customers from sitting down, reported China Daily. 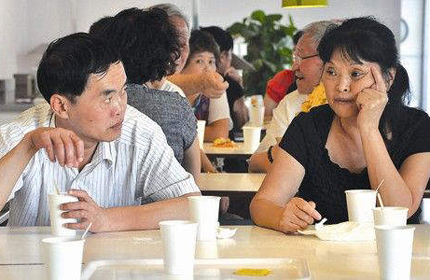 These people also disturb other customers when they talk loudly and sometimes quarrel. 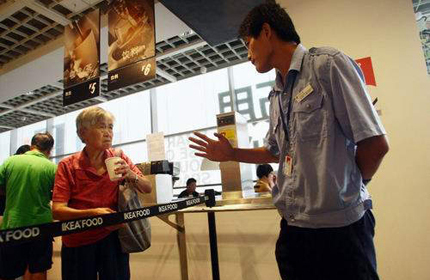 China Real Time reports that Ikea's restaurant business goes down by about 20% and that more coffee condiments are used on the free coffee days. Mashable is the go-to source for tech, digital culture, and entertainment content for its dedicated and influential audience around the world.